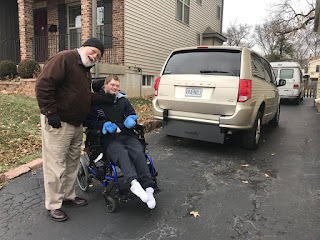 John Paul and his new van!!! This last weekend surprised me. Twice. As you know, my little brother John Paul suffers from a host of limitations: autism, hydrocephalous, blindness and aphasia, among others. He is confined to a wheelchair or his bed. 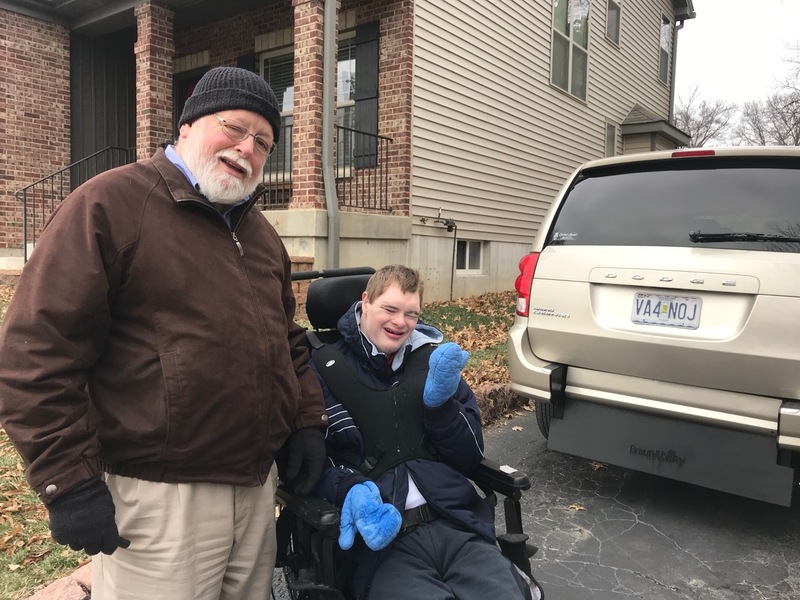 Taking care of John Paul has always been a challenge, but my parents have poured themselves into him, and, instead of not living a day like the doctors had originally told them, John Paul is now 22 years old. For the last ten years or so, one of the hardest parts of caring for John Paul was transporting him places. Our old van was too much of a hassle—not to mention danger—to him and us. We could take John Paul ice skating because the rink is a five minute walk from our house. We also could take him on walks through the neighborhood. 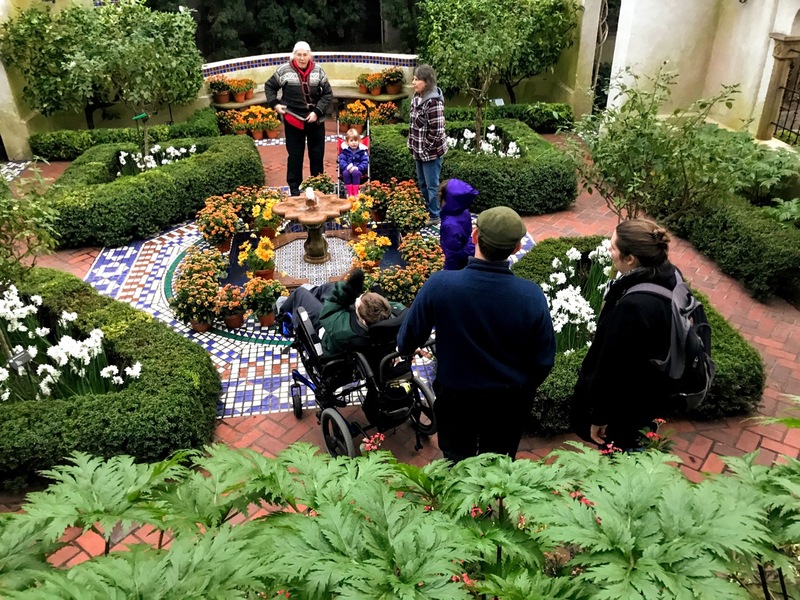 But for the life of me, I can’t remember the last time we took him anywhere else except for doctor’s appointments, when we absolutely had to. All this changed last week. 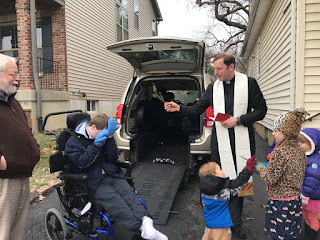 My mom and dad started a Gofundme campaign December 8th, and by January 24th they had received donations from all over—enough to purchase a wonderful minivan perfect for transporting John Paul. Our last van had a hydraulic lift, which sounds cool but is actually very complicated. This van simply has a sunken floor and a ramp that you lower down by hand to push him in. It is way easier to use than the lift and it’s very safe. While I was at home last weekend, we got to try out the van. And it worked! We took John Paul to the Missouri Botanical Gardens where they have a huge geodesic dome with a rainforest inside—perfect for a little winter pick-me-up. It was so easy getting him in and out of the van. And John Paul had a blast. When we got back home my mom mentioned how different it all had been: with the old van doing what we just did would have completely wiped them out for the rest of the day. The joy isn’t just in getting the new van. It’s in knowing the love and support of so many family members and friends is behind it. Every time we use it from now on, all of that love and care will travel with us and John Paul. I don’t know how to describe it. It’s kind of like when you have some good news and you want to share it with the whole world, but this is a bit like in reverse. 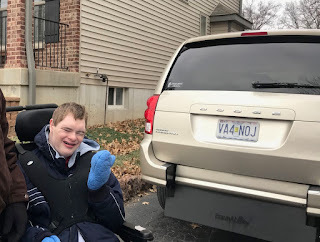 The whole world is sharing in the good news of every time we can take John Paul out for a spin or an adventure. And John Paul is happiest of all, because he sure loves to move. 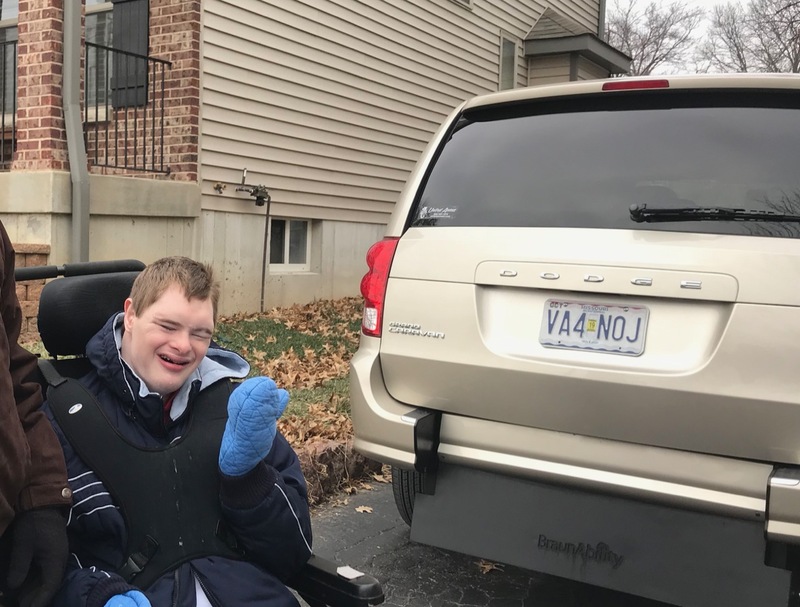 He spent his time in the van rocking and laughing and enjoying himself… and whacking the spare tire next to him—John Paul sure loves to hit stuff! There was a second little sorrow turned to joy this last weekend when I was at home. I had offered to put a new thermostat in my sisters apartment. I pride myself on being something of an electrician, so a thermostat should have been a piece of cake. But I botched the job, and my sister called hours after I left informing me that her heat wasn’t working at all. So I went back with my dad and—we thought—fixed it. An hour later she called again to tell me that it was only blowing out cold air. So I went back a third time the next day, at which point I finally acknowledged that I was out of my league and that she should probably call the utility company. I was driving back to Cincinnati feeling like an electrical failure when I got a call from my dad. It turns out that when the utility company had come they found several leaks in the gas pipes in her basement. It took them two days to fix the leaks. Gas leaks are bad news. It was only because of my mistakes that the company ever found them. O blessed bungling! And thinking back to the van, O blessed sorrow! 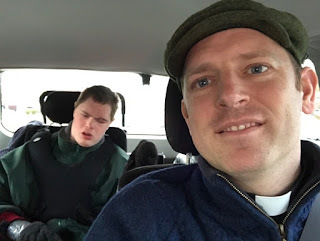 John Paul and his limitations have put us in contact with so many people whom we would otherwise never have known. And not only that, we’ve seen the generosity of so many people whom we don’t know. Some people gave large amounts, others small. 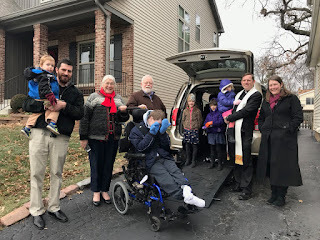 My dad commented how he’s sure that some of the donations were like the Widow’s Mite in the Gospel—people taking food out of their own mouths to help get John Paul his van. Wow! You wouldn’t think that sorrow can transform into all that: physical limitations into a groundswell of goodness and generosity; a botched fix-it job into averting a possible disaster. 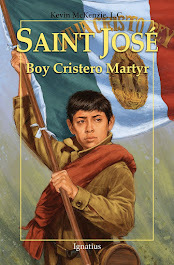 For all of this, for more, I am grateful. I am grateful that evil does not have the last word, that people are so so good, that God can bring good from any sorrow. Happy Feast of the Presentation of the Lord! May God bless you, and help you see the sorrows-turned-to-joys in your own life!